In a 2018 year in review post, in which Valve outlined plans for Steam in 2019, the company also provided some rare insight into how many people use Steam every day and every month. And the numbers are, unsurprisingly, big: in 2018, Steam averaged 47 million daily active users and 90 million monthly active users. It also broke the record for concurrent players early in 2018, with 18.5 million. While Steam is clearly growing fast—it recently passed 30,000 games, and just look at the amount of data Valve has served up—it's interesting that those concurrent users are actually down since it broke that record in early 2018. 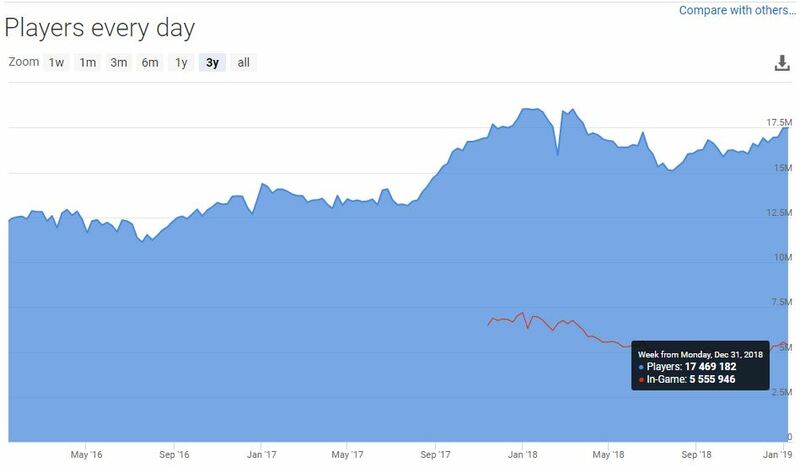 This chart from SteamDB shows daily users declined through summer 2018, before rebounding to around 17.5 million at the beginning of 2019. Meanwhile, in its 2018 year in review, Valve also showed how the makeup of Steam has changed over the past six years. The big takeaway, of course, is Asia's massive growth, mostly fueled by China. This chart is based on sales, rather than total logged in users, which is especially impressive given how (relatively) few Steam games have Chinese language support. According to Steam's most recent hardware survey, English is still the most popular language with a 38 percent share, while Chinese is in second place with 21 percent. In other news, Steam delivered around 15 exabytes of data to its users in 2018. 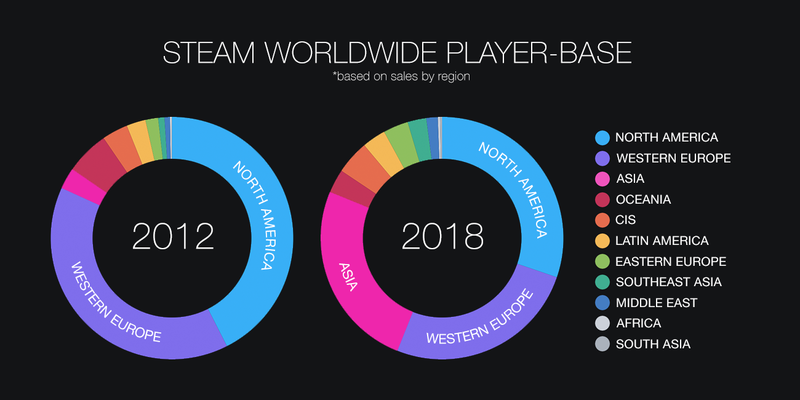 Over the past three years, Valve has been delivering its games and other data over a global private network it's been steadily building up, as it detailed in a 2018 year in review post today. "We partner with Internet backbone companies around the world to build this network, which connects directly with over 28,000 regional and local networks in 28 cities in 21 different countries," Valve writes. "This private network lets us deliver games and carry the game, voice chat, and other data with high speeds and low latency to users in more than 229 countries." What kind of speeds, exactly? Valve says its "edge network capacity" is now 12 Tbps (that's 12 million megabits per second). The "edge" here refers to the locations of servers users connect to. Cloudflare has a good breakdown: "An edge server often serves as the connection between separate networks. A primary purpose of a CDN edge server is to store content as close as possible to a requesting client machine, thereby reducing latency and improving page load times." If you've ever marvelled at how fast Steam's download servers are, there's at least part of the explanation. 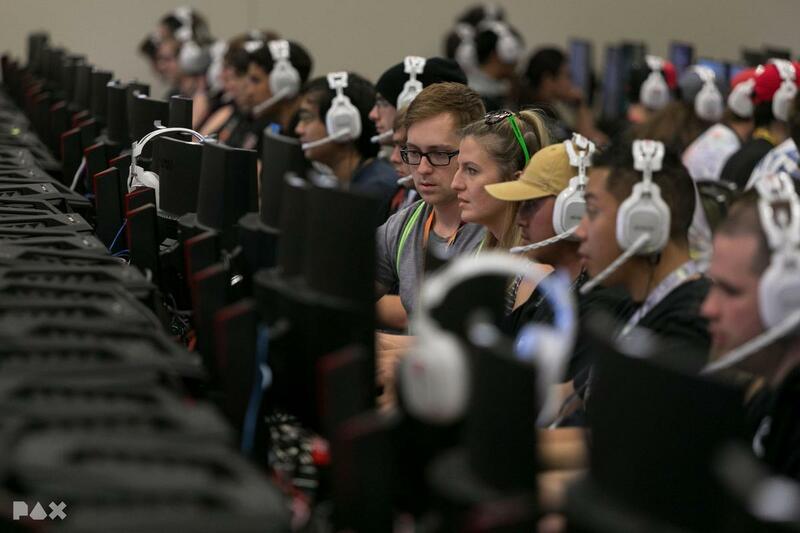 Valve says its network capacity is also growing 50 percent year over year. That growth is likely necessary to keep up with the growing Steam userbase (and growing game download sizes). Steam's chart above shows that in 2014, it delivered less than four exabytes of game data, in total, to everyone who used Steam. That's still a lot: it's four billion gigabytes. 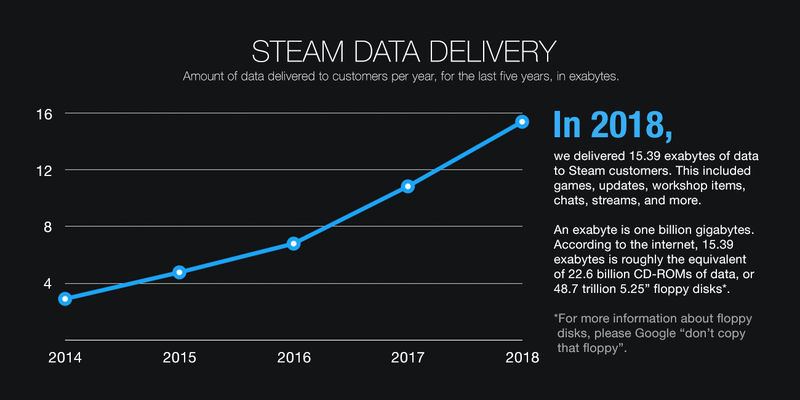 But in 2018, Steam's total data delivery was 15.39 exabytes, quadruple where it was just a few years ago. For a bit of fun perspective, Valve noted that it now delivers more game data in one year than there was internet traffic period when Steam launched: "The entire traffic of the Internet in 2003 (the year we launched Steam) is estimated at 9.3 exabytes." A few more interesting facts and figures are in the details of Steam's server infrastructure. Some of Steam's major functionality is powered by a whole boatload of SSDs: "We deployed new SQL Servers, now with 2.7 petabytes of FAST solid state storage, to keep up with the 1.7 billion trading cards granted, the 488 million trades completed, the 245 million emoticons crafted, and the 218 million screenshots posted in the last year." We have to wonder what sort of SSDs Valve is using, because even using 16TB SAS models, that would still mean an array of 168 SSDs would be required.